Silver River Basement Systems of Colorado & New Mexico offers only the most carefully researched, highest quality sump pump systems in the industry. Their experienced sump pump installation crews pride themselves in their ability to complete a quality waterproofing job in a single day, with larger jobs taking two. They have earned a fantastic reputation in Colorado & New Mexico since they opened their doors for business in 2001, and they'd be glad to help you dry your basement as well. For a free, no obligation sump pump installation estimate, call or contact them online today! They serve areas throughout CO & NM, including Greater Grand Junction. Silver River Basement Systems offers three excellent sump pump products to homeowners who'd like to protect their wet basement and transform it into usable storage space. 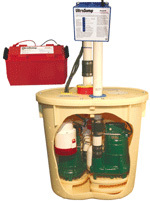 Each system comes with a sump pump water alarm, a durable pump liner, and a reliable Zoeller Sump pump. 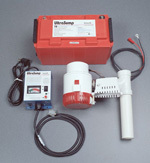 The SuperSump® Basement Sump Pump installs in your basement floor in a 2-foot deep liner made of hard, durable plastic. Installed with a sturdy airtight lid with rubber grommets around every opening, this pump is ideal for keeping odors, humidity, and sump pump noise from rising upwards into the home. 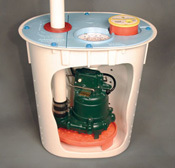 Inside the sump pump liner, the SuperSump's cast-iron sump pump rests on a plastic stand, keeping it away from any dirt and debris that may collect on the liner's floor. At the top of the liner, a floor drain exists. This drain's special floating ball and cup design ensures that the system can drain water from a plumbing leak (such as a burst washing machine hose) while also ensuring that humidity cannot rise upwards through the drain. Your sump pump system can lose power in many ways. Other than simply blowing a fuse, it's possible for the system to become accidentally unplugged, or for the entire home to lose power during a large storm-- right when you need it most. 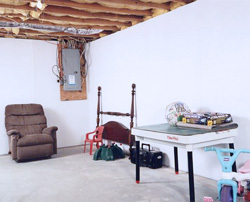 Even with a sump pump alarm installed, your basement may flood if you're at work or on vacation when it rains. The UltraSump® Battery Backup System, added to your SuperSump® system, is the answer. Able to pump out more than 11,500 gallons on a single charge, this battery powered pump can keep your home dry and protected. 11,500 gallons is about the size of a small swimming pool- more than enough pumping power for almost any scenario. For added power, multiple batteries can be hooked up to a single UltraSump®, allowing for an even longer charge. Sump pump systemscan fail to keep your home dry for three reasons: either the sump pump has a mechanical failure, the power has gone out, or the sump pump can't keep up with the amount of water flooding into the home. The patented TripleSafe sump pump system is the ideal answer to all three of these problems, with three levels of waterproofing protection for your home. The TripleSafe Sump Pump includes the Zoeller M53 cast-iron sump pump the SuperSump® has as well as the UltraSump® Battery Backup Sump Pump. Both systems are housed in a larger, double-chambered sump pump liner with an additional backup sump pump- the Zoeller 1/2 horsepower M98. With the Zoeller M98's ability to pump out over 4,300 gallons per hour, it can kick on when the smaller M53 is overwhelmed, pumping back water and keeping even the heaviest flooding well under control. If your problem is a wet crawl space, the SmartSump™ Crawl Space Sump Pump is just what you need. The SmartSump™ includes the same, powerful Zoeller M-53 and optional UltraSump® that's included in the SuperSump® system. It includes a sump pump alarm that will sound off in the case of a crawl space plumbing failure, letting you know of sump pump failures or potential plumbing issues should any arise. Silver River Basement Systems would like to meet with you to talk about installing a sump pump in your home. They can professionally inspect your basement to identify why your basement is flooding, where the sump pump would be most effectively installed, and which waterproofing options would be best in your home. Before each visit, they send along a free, 88-page book on basement or crawl space waterproofing, valued on Amazon.com at $14.95! Estimates include a written quote, and each comes at no obligation to the homeowner. For your free waterproofing and sump pump estimate, call or e-mail Silver River Basement Systems today! 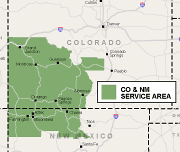 They serve Colorado & New Mexico, including Greater Grand Junction.